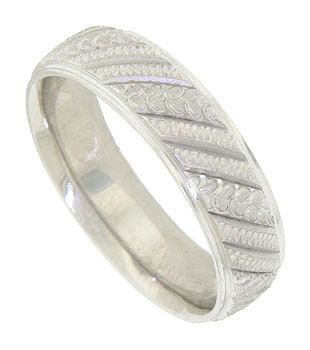 This 14K white gold mens wedding band features a repeating pattern of diagonal engraved ribbons. The matte surface is deeply carved with pairs of zig zagging ribbons framing broader ribbons leaves. The edges of the ring are smooth and brightly polished. 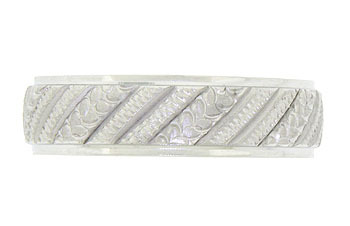 The antique style wedding ring measures 6.07 mm in width. Size 10. We cannot re-size, but we can reorder in other sizes. Also available in 18K, yellow gold, platinum and palladium. Contact us for current market cost.